#3: Native Americans are poor because they want to be poor because that’s how they get all the free stuff from the government that the government gives them. #2.5 Native Americans who are not poor have casinos. Those casinos make them so rich that they buy the government off to give them things. #2 If you go to a reservation you will get shot. Or beat. Or shot and beat. Or somebody will be mean to you. They will probably be mean to you and then shoot you. 1) Movies about noble or murderous savages are realistic portrayals of Indians. 2) Reservations are cesspools of crime, poverty, despair, and hopelessness. 3) Indians don't pay taxes, live off welfare, and get everything free--either from the government or casinos. In this form, I could support these as the top three Native stereotypes. 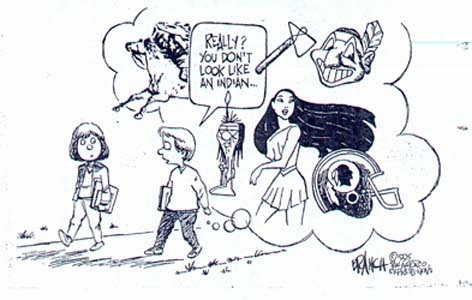 They sum up the perceptions most Americans have about Indians. For more on the subject, see Comanche Chairman Justifies Tonto's Stereotypes and Mithlo's TEDx Talk on Stereotypes. When I first heard "colors of the wind", I thought "WTF does this even mean?" Great article! You hit it on the head this time Rob! I think that was the first of the "modern" run of Disney cartoons (that began with "The Little Mermaid") that I didn't bother to watch. Either that or Hercules.